The Second Judicial District Commission on Judicial Performance, on a vote of 10 to 0, unanimously recommends that Judge Andre L. Rudolph BE RETAINED. Prior to his appointment to the Denver County Court in September 2004, Judge Rudolph was a magistrate in Adams County for the Seventeenth Judicial District. Judge Rudolph began his legal career in the Colorado Public Defenders Office. He received his undergraduate degree from the University of Wyoming and his law degree from Creighton University School of Law in Omaha, Nebraska. 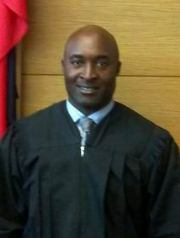 Judge Rudolph currently presides over juvenile matters in the Denver County Court. He previously has presided over traffic and state criminal matters. Judge Rudolph has been active in community service activities including serving on the board for Denver Kids Inc. and participating as a guest speaker for the Northeast Denver Leadership symposium. The Commission conducted a personal interview with Judge Rudolph, reviewed his written self-evaluation supplemented by his letter to the Commission, and some members of the Commission observed Judge Rudolph in court. Judge Rudolph did not submit written opinions or transcripts of oral rulings in three cases as contemplated by the rules. Judge Rudolph explained that in his current assignment in a specialty court such as the juvenile court, there are few trials or contested hearings requiring rulings on legal issues or an analysis of contested facts. The Commission also reviewed the results of surveys of attorneys and non-attorneys, including written verbatim comments. A total of 22 non-attorneys completed the survey, and only 4 attorneys who completed the survey. Of the attorneys, 50% recommended to retain and 50% not to retain. Of non-attorneys completing the survey, 91% recommended retention and 9% made no recommendation on retention. In the survey results, compared to other county judges standing for retention, Judge Rudolph received ratings from non-attorneys on average in the areas of demeanor, communications, and application of law and slightly above average in the areas of fairness and diligence. While Judge Rudolph received lower than average ratings from attorneys in the areas of case management, application and knowledge of the law, communications, demeanor and diligence the Commission did not consider those ratings to be significant due to the extremely small number of attorney responses. Finally, Judge Rudolph has been on an improvement plan as recommended by the Commission since his 2012 retention. The Commission believes that Judge Rudolph has been serious in pursuing an improvement plan and has shown improvement in the areas which caused the Commission concern in 2012.